As a 14-year-old playing in one of the top leagues in Western Canada, it can feel like the next options for hockey are overwhelming. They can consider the American college route and play Junior A for a few years, or if possible, join the Western Hockey League (WHL), play for the goal of becoming a professional and build up the years of free education. The WHL wants to keep players informed about the opportunities beyond the on-ice action, and in conjunction with the Canadian Sport School Hockey League (CSSHL), they hosted two showcases in December: one in British Columbia and the other in Saskatchewan. From Dec. 8-10, eight of CSSHL’s Bantam Prep teams: Burnaby Winter Club, Delta Hockey Academy (Green & White), Edge School, Northern Alberta Xtreme, Notre Dame, OHA Edmonton and the Okanagan Hockey Academy took to Delta, B.C. for competition, lessons and fun. Not only does the WHL help host the event, but they also seek to educate players and families about their league. The 'Dub brought in speakers who had different experiences post-WHL – coaches, team staff, professional players and some who followed education and went to Canadian universities on scholarship. Many of these players will be drafted into the WHL next year, and teams are more likely to select players if they know they will get them to play for them, rather than keep NCAA eligibility and stick in Junior A.
Tyson Giuriato, the director of media and communications for the CSSHL, said scout attendance is high. Two provinces over the following weekend, the second WHL/CSSHL Showcase was hosted in Saskatoon with the help of the hometown Blades squad. Six teams made the trek: Notre Dame, Pacific Coast Hockey Academy, Pursuit of Excellence, Rink Hockey Academy, Shawnigan Lake, and Yale Hockey Academy. Giuriato mentioned how the WHL and CSSHL actively look to involve parents over the weekend. Some CSSHL players consider playing Junior A hockey and heading the NCAA route instead of playing major junior, so this is a big opportunity for the WHL to stress the importance of education to their league. “These Showcases allow our students to learn more about the WHL, the benefits of playing in the league, and most importantly, more information surrounding the WHL Scholarship Program. 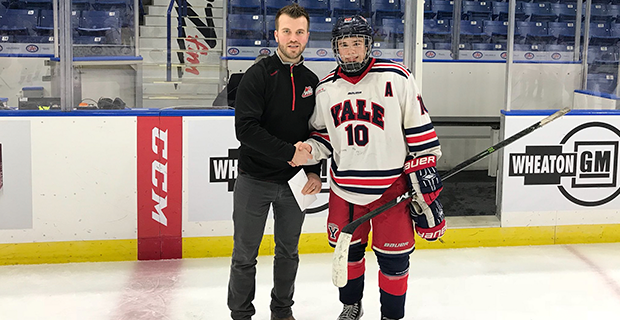 The WHL does a great job with their presentations, which not only includes WHL staff, but also former WHL players that have taken advantage of the post-secondary educational benefits the WHL has to offer,” Giuriato said.